Matt received his PhD in Physics from the University of North Carolina at Chapel Hill. He was a postdoctoral fellow at Northwestern University and at Duke University, and the Director of Concept Development at Nekton Research and at Bluefin Robotics. 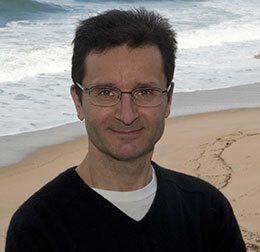 He recently joined MBARI as a Principal Investigator. Mathieu’s research interest is biologically-inspired vehicle persistence, particularly bio-inspired proprioception modalities and bio-inspired internal state prognostication.